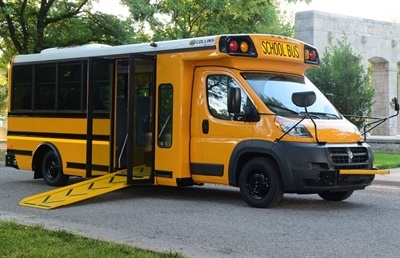 Instead of a wheelchair lift, the Low-Floor Bus includes an integrated wheelchair ramp accompanied by a wide service door that all students use. Shown here is Carroll County (Ga.) School System’s new Low-Floor Bus. A new Type A school bus from Collins Bus Corp. is drawing attention because of a feature that can offer greater independence and a more comfortable ride to some students. 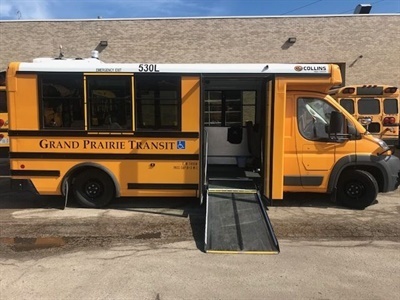 Instead of a wheelchair lift, the Low-Floor Bus includes a wheelchair ramp below the frame rail accompanied by a wide service door that all students use, along with a single step for ambulatory students, to board and exit. Students who use wheelchairs are integrated with ambulatory students, since the ramp allows them to all enter and exit the same way, which gives them more independence, says Matt Scheuler, president and general manager of Collins Bus Corp. The bus also provides a smoother ride for students in wheelchairs because they are positioned in the center of the vehicle, forward of the rear axle. Not that it was only created with students who use wheelchairs in mind; the Low-Floor Bus is designed with the flexibility to accommodate a mix of ambulatory students, those who have some mobility, and up to three wheelchairs. The Low-Floor Bus went into production in summer 2018, and over the last few months, Collins has made dozens of deliveries. 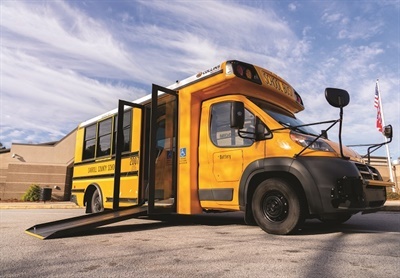 School Bus Fleet spoke with the first school district and the first school bus company to receive deliveries of the bus: Carroll County (Ga.) School System, which received one Low-Floor Bus in February, and Cook-Illinois Corp., which took delivery of two in fall 2018. Both noted the comfort and ease of access the bus brings to students and the efficiency it allows drivers. John Benish Jr., president and chief operating officer for Cook-Illinois Corp., says that the Low-Floor Bus helps to mainstream students who use wheelchairs. Shown here is one of Cook-Illinois Corp.’s two new Low-Floor Buses. In addition to helping students in wheelchairs, the ramp on the Low-Floor Bus can also assist students with walking impairments. The bus helps “anybody who has a limited ability to get themselves into or out of a vehicle to load themselves with little assistance,” Scheuler says. Additionally, the Low-Floor Bus is not only designed for students who need to use the ramp. The vehicle can operate with a completely ambulatory passenger floor plan, a mixture of ambulatory and special-needs students, or any combination in between. Bruce Tidaback, director of transportation for Carroll County School System, says his transportation department chose a floor plan designed to accommodate 10 ambulatory students and two students in wheelchairs. This is in keeping with the transportation department’s preferred practice of having no more than two students in wheelchairs ride on the same bus for safety reasons. “It enables us to safely and expeditiously exit during an evacuation,” Tidaback explains. The district transports 312 special-needs students, 27 of whom use wheelchairs, with five Type A buses in addition to the Low-Floor Bus. Moreover, the bus is dual-purpose. Also configurable as a commercial bus, the Low-Floor Bus can be a good fit for senior citizens and paratransit. Collins is in the early stages of vehicle production for the commercial market, having built and delivered one unit to an assisted living facility, Scheuler says. Parents of children with mobility issues, Scheuler adds, like that their kids are now empowered to get on a vehicle themselves, just like anybody else. John Benish Jr., president and chief operating officer for Cook-Illinois Corp., which serves thousands of special-needs students and received two Low-Floor Buses that it has been operating since the start of the 2018-19 school year, agrees. Additionally, loading these students closer to the front of the bus helps to mainstream them with the other students, Benish Jr. adds. “It’s nice to have the students [in wheelchairs be able to] interact better with other students on the bus,” he says. With the Low-Floor Bus, students in wheelchairs are not lifted off of the ground to board, which can make some feel uncomfortable. Tidaback agrees, noting that some students in his district have anxiety over being lifted off the ground on a traditional special-needs bus. He adds that students with neck problems and/or assisted breathing devices can potentially experience a smoother ride than they typically might on a special-needs bus. Jake Tucker, a student who uses a wheelchair and will soon ride the new bus to school, echoes Tidaback’s point after getting a chance to check it out recently. He says that the ride is “a lot smoother” and “not so rough” on his neck. The bus being built low to the ground is a significant plus, according to Katie Tucker, who says that students in wheelchairs often endure a bumpy bus ride. “I feel that this bus will bring attention to that, and kids won’t be bounced around as much,” she adds. That extra stability can also provide a safer ride, especially for students who have medical equipment. 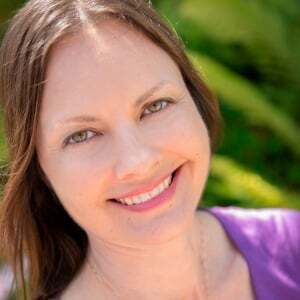 She adds that she thinks students with wheelchairs will feel a little safer in the bus as well. Another beneficial feature is that if there is an issue with the ramp temporarily not working, students can still board and exit the bus fairly easily. Both Carroll County School System and Katie Tucker have a set of portable ramps on hand to easily help students out of or onto the bus. 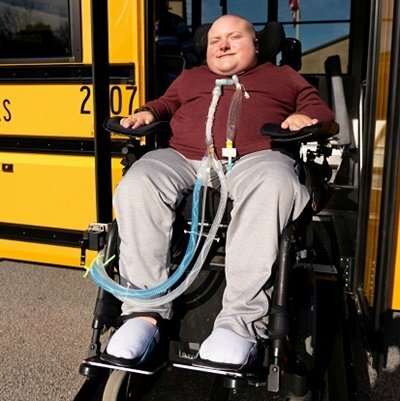 Cook-Illinois Corp.’s Benish Jr. says that because the school bus company transports thousands of special-needs students who use wheelchairs, the idea of them being closer to the ground and therefore even safer when boarding and exiting was appealing. “It’s nice because it’s a lot lower and they are just a lot more comfortable getting in and out of the bus,” he adds. Because the door for the ramp is automatic, drivers and monitors do not have to go outside the bus, as they would to open and close the lift door. It takes about 30 seconds to open the door, fully deploy the ramp, stow the ramp, and close the door, Tidaback says. Benish Jr. says that Cook-Illinois’ drivers like the new buses, finding operation to be easier, in particular with getting the wheelchairs on and off the bus. Drivers and aides have less work to do in assisting students with boarding and exiting. “It’s much more efficient for drivers, and more accessible for passengers,” Scheuler notes. The general feedback that Collins has received about the Low-Floor Bus is that it is a significantly better way to transport students in wheelchairs, he says. Since launching the Low-Floor Bus (pictured here) in 2017, Collins has reduced the turning radius, made changes to optimize seating, and included a battery compartment with external access. With a multitude of floor plans available, the Low-Floor Bus can accommodate any group of students. Floor plans include a variety of seating widths and placement, with a maximum of five seating rows, in the 15-passenger capacity vehicle, Scheuler says. Standard equipment for the Low-Floor Bus body includes 1/2-inch marine-grade plywood flooring, LED stop/tail/turn/backup and interior dome lights, one-piece tubular steel roof bows, and an electric entrance door. The bus is built on a front-wheel-drive Ram ProMaster chassis, powered by a 3.6-liter gasoline V6 engine, and has a wheelbase of 188 inches and a GVWR of 9,350 pounds. There are also overhead storage compartments placed above the driver and the passenger seats. Another compartment, integrated into the floor of the cab area, can be used to store equipment such as safety triangles and bodily fluid cleanup kits. Options for the bus include three-point seat belts, 5/8-inch marine-grade plywood flooring, AM/FM/Bluetooth radio, backup alarm, backup camera, egress window, roof escape hatch, and floor seat track. A camera system that gives the driver a 180-degree view of the passenger loading side of the vehicle is also available. Since launching the Low-Floor Bus in 2017, Collins has reduced the turning radius, made changes to optimize seating, and included a battery compartment with external access.